Seems to be a comparatively small scale and lower cost mission. So this is a flyby mission? But it investigates Triton and Io? Color me impressed. This would seem tricky just on a Discovery budget, but not utterly impossible. Time to call our local consultant Blackstar! With the fast flyby of Io, I'm assuming it would not need nearly the rad-hardening as the Juno spacecraft. Given the early Pioneer spacecraft survived true, but probably wise to include some shielding even if not as hard as Juno's or likewise Europa Clipper's. If they desire data from Io and the rest of Jupiter's moons protecting that data before transmission is essential. It's great to see missions like this proposed. I would love multiple flagship missions to the Icy Giants, but in the meantime, let's also consider these cheaper, more focused missions as well - hopefully as a supplement to the flagships, not as a substitute. Looking for life in our solar system seems to get more promising all the time, we just need to get out there and explore, the results may be profound. And vjkane, and a few other subject luminaries that grace this forum...! I would absolutely love it if such a mission could be conducted within a Discovery budget level, especially since this mission opens the possibility of more KBO flybys, potentially even one which is several hundreds of km across. However Is it even possible that such a mission can be conducted with only two MMRTGs? 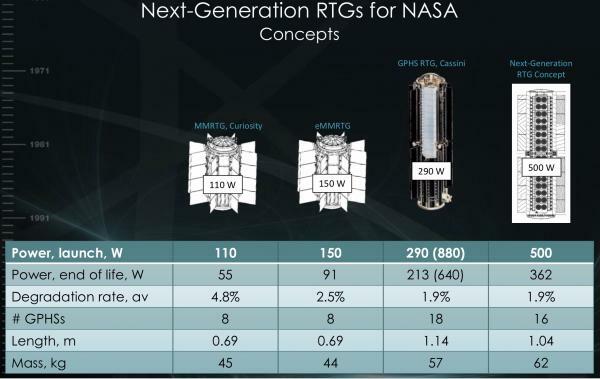 Assuming that the SKD thermocouples required for eMMRTGs aren’t ready by 2026 this spacecraft would likely have less than 100W (if even that) of power by the time Trident would reach Neptune 12 years after its launch. That would be less than half what the GPHS-RTG provided for New Horizons in 2015 so I’m curious how the team would address the lower data-rate. Could someone comment on the trade offs between flyby versus an mission that actually enters orbit please? Is it simply that it would need a bigger rocket with more delta V and larger fuel tanks on the probe, or is there much more involved? Edit: Ok i did some googling, and from what I understand from some stackexchange postings, any orbit mission would need braking through the atmosphere of the target object, which is likely only possible after enough data on it has been collected by earlier flyby missions. Placing a probe into orbit around a celestial body is a function of delta-v, orbital mechanics and launch window. Aerobraking/aerocapture are only possibilities for celestial bodies with atmospheres, which vary widely in a number of characteristics, so as you noted a flyby mission may provide meaningful data for a later orbital mission. Sciencealert article, in somewhat ambiguous language, possibly indicates a Venus flyby, most likely a gravitational assist? Since developing the instruments for this mission is a one time thing. If there is enough Pu238 available for the RTGs. How much extra will it cost to have a pair of spacecrafts launch a few weeks apart for this mission profile instead of one spacecraft? The proposed trajectory does multiple Venus and Earth flybys (although I forget exactly how many of each). This is one of the limitations of Discovery proposals needing to depend on modest cost boosters. Since developing the instruments for this mission is a one time thing. If there is enough Pu238 available for the RTGs. This thread explains it in detail, but I can also add that initially there were 3 MMRTGs available for the New Frontiers 4 competition, however Dragonfly (if it will be selected) needs only 1 of those RTGs so given that DOE has enough for a couple more of them by the time full production of new PuO2 is up and running by 2025, it was decided that the Discovery 15 /16 competition could make use of that capability. How much extra will it cost to have a pair of spacecrafts launch a few weeks apart for this mission profile instead of one spacecraft? Can’t really say but I think it’s likely well outside the $500M cost cap for a Discovery mission and even if two identical probes could be build for that ammount, they don’t have another 2MMRTGs available to power the other spacecraft. IIRC Alan Stern argued for just such a twin spacecraft for New Horizons. It might have been conceived as a Neptune/Triton flyby. It would have taken those advantages of reusing the non-recurrent Engineering (NRE), shared the operations team and facilities, and shared the overhead for approval of nuclear materials launch. However, there are substantial costs, including cumulative months on the DSN’s big dishes and the big expensive rocket. It’s not in response to a call for which there is a budget. It can’t be seen as significantly increasing the probability of success because that would be an admission of high risk and much higher mission cost. I am surprised that the mission uses two MMRTGs when New Horizons uses a single RTG. Then I looked at the specs, and an MMRTG produces 110W at launch while the NH RTG supplied 202W. Also, the MMRTG power output degrades much faster than the previous generation so by the time Trident would arrive at Triton, it would have significantly less power than New Horizons had when it encountered Pluto. I hope that the modest power levels are not a significant issue for the team. IIRC the GPHS RTG on New Horizons put out ~245 W at launch instead of ~295 W because a full load of “fresh” Pu was not available. Trident plans to make up for having about half the electrical power at encounter with batteries. It’s not clear if Trident would have enough power to run simultaneously the redundant transmitters like NH. Not doing that doubles the required DSN time and cost. Two MMRTGs should equal 240 W, so close to NH.